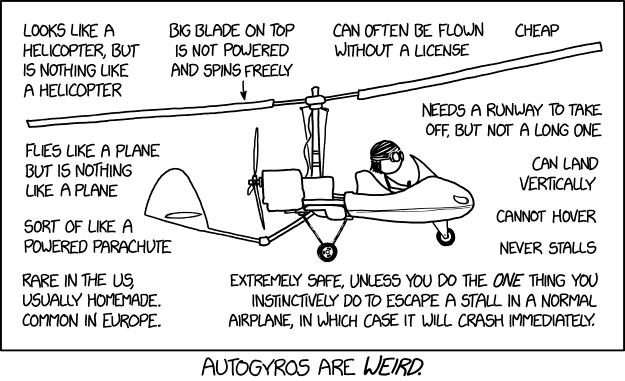 This recent XKCD comic is all about autogyros. So what is that one thing, and why does it not work in autogyros? ... Unfortunately, as soon as the rotor stops spinning, the whole aircraft falls like a brick and the rotor may be impossible to restart in flight. This is a situation that should be avoided at all costs. Normally it is not a problem since the weight of the aircraft keeps the rotor spinning. However, if the weight becomes too low or even negative, the angle of attack will become negative, and the rotor will slow down and eventually stop. It can happen when the pilot "pushes on the stick" and dives. Unfortunately, "pushing on the stick" is also how you escape a stall in a fixed wing (normal) airplane as it is a way to regain airspeed. This is actually a counter-intuitive maneuver but because a stall is an emergency, pilots are trained to do it instinctively. It can trick a pilot trained in fixed wing aircraft into doing the one thing that shouldn't be done on a gyro. I believe what the comic is referencing is Mast Bumping. Rotor blades are very flexible, and for a bunch of reasons, are free to pivot around the mast. (The shaft the blades are spinning around) In normal flight, the blades are held taut by centrifugal forces and the weight of the rotor craft they are supporting. If a pilot were to suddenly push down on the Cyclic, you can create a low G, Zero G, or even a negative G situation. The blades are not having to support the weight of the aircraft anymore and the blades can potentially pivot so much as to strike the mast, tail, and even the fuselage. So if an Autogyro pilot got into into a high angle of attack situation, and reacted by suddenly pushing the nose down into a zero G situation, the rotor blades would float weightlessly along with the aircraft. Its usually the next action that causes mast bumping. The pilot, out of his high AoA predicament, now pulls up to level off. The blades, still weightless, pivot without any resistance and strike the aircraft. This is rarely a survivable situation. This is a well known problem with gyrocopters. The first answer was partially correct in that the problem was caused by pushing the stick forward and unloading the rotor. However, the problem wasn't a slowing down of the blade. The actual problem was that many of these gyrocopters would tumble under these conditions. If you were close to the ground you would crash before you could recover. And, even if you had altitude the tumble could overstress the rotor and a crash would still occur. The biggest problem though was that no one seemed to know why and since those who did tumble didn't usually survive there wasn't anyone to ask. So, if you flew a gyrocopter the first rule was to never push forward sharply and unload the blade. Eventually, people who understood aerodynamics and physics got involved. They studied gyrocopters and realized that it wasn't a problem that was inherent to the type. The actual problem was that many of these had a thrust line that was above the center of gravity. In the small gyros the pilot's weight accounted for a lot of the loaded weight and the pusher configuration meant that the pilot's seat blocked the airstream. So, there was a incentive to raise the engine both to get clearance for a larger propeller and to get the blade up into clean air. The A-10 Thunderbolt II has a similar problem. The engines are placed above the fuselage so that the hot exhaust goes over the horizontal stabilizer where it is blocked from view of heat-seeking missiles on the ground. This high thrust causes the A-10 to pitch downward. The solution was to angle the engines downward slightly which would normally make the plane pitch up. So, these cancel out. So, anyway, the high thrust line isn't usually a problem on gyros since the main drag is from the rotor which is even higher. However, this doesn't work when you unload the rotor. Unloaded, the rotor drag goes to zero and free-body physics takes over. If the thrust line is above the CG then the aircraft will rotate forward and if it rotates far enough you will tumble. The only solution is to lower the thrust line so that it passes through the CG. This can make the aircraft pitch up more since the drag from the rotor is still high. You can try to counter this by angling the thrust line up but this may put it back above the CG. And, the thrust line might still be above the CG if another lighter weight pilot flies. Not the answer you're looking for? Browse other questions tagged stall aircraft-operations autogyro or ask your own question. How does the use of Leading Edge Root Extension help in increasing stall angle? Does the expression “stall speed” have a definition?